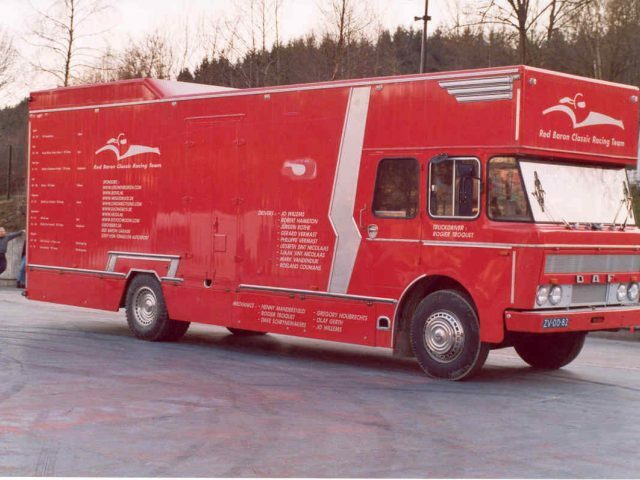 A former furniture moving van was converted in 2000/2001 into a practical race transporter for historic motorsport. 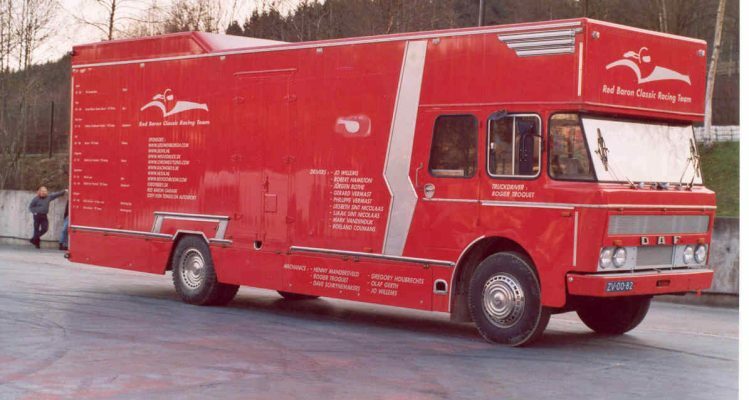 A lot has been invested to turn it into a real eyecatcher and practical racing truck. Equipped with new roof plating and insulation. Side access with customized aluminum staircase. Underbody side boxes made of stainless steel for material storage. Safety mirrors for cyclists. Additional side mirrors. Additional interior lighting. Various 220V sockets inside and outside the truck. Last year, the 2 cabin doors and windshield were renewed and a new windshield was fitted with new rubber gaskets. In original condition with original dashboard and with rare white steering wheel. Sleeps 6 pers. Seats in U-form, table and kitchen unit. Many storage cupboards, also under the benches. One-piece tailgate with winch also suitable as a ramp for a car. Rear of the roof is raised for any built-in lift for 2nd car. Extra storage space in the rear part. Equipped with fold-out workbench, vise, various holders and shelves. Annual MOT. Fresh oil every year, new filters and fuel filter. The technical parts were regularly maintained and partially renewed. New DAF (exchange) engine approx. 6 liters with turbo, 170 bhp / 125 Kw, new stronger clutch. Rear axle with splitter, effectively 10 gears. New master cylinder with servo. All wheel brake cylinders and liners have been renewed. New spring package and shock absorbers front, new radiator and hoses and clamps. New tires. Set of spare injection lines are available and as well as a brand new spare starter motor. Batteries are 1 year old. Main power switch for batteries. Towbar is dismountable. Large awning 10 x 7 meters plus lighting. Compressed air connection included. Extra sockets in and outside the truck 220V. Incl. all necessary extension cables and adapters 220 and 380 V.
The paint is 16 years old with corresponding signs of wear and patina. No painted lettering on bodywork, only self-adhesive transfers were used. There is still some work to be done. Chassis and the rear area are perfectly rust- and damage free. The truck is registered as a classic vehicle and as a camper, so no road tax, no toll and no Sunday driving ban on German motorways. As a Historical Truck, it always takes precedence during Historic Race events over other trucks in the paddock and / or behind pit lane.